Melbourne born soprano, Carmela De Losinno is a graduate from the Victorian College of the Arts and Monash University. 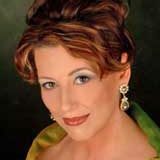 Carmela has been a member of Opera Australia since 1998 and has studied and given concerts in both Germany and Italy. She has performed operatic roles ranging from Santuzza, ( in Mascagni’s, Cavalleria Rusticana), Suor Angelica, ( in Puccini’s Suor Angelica), to Blanche,(in Poulenc’s Dialogues of the Carmelities), Nancy, (in Britten’s Albert Herring) and Mercedes, (in Carmen), among others. Recent performances include: a season of the comic opera, ‘Postcards from Carlton” with MTO and the ’Puccini Festival Australia’ production of ‘Le Donne di Puccini’ at Her Majesty’s Theatre. Oratorio performances include: Elijah with the Amadeas Chamber orchestra and with the Heidelberg orchestra and Messiah with the Heidelberg Choral Society. Carmela has also won several vocal competitions and was a finalist in the City of Sydney MacDonalds Aria. She performs regularly in concert, festivals and recitals around Australia and is in constant demand for corporate events. Carmela has released her first CD of Italian songs and arias, titled ‘Il Bacio’.